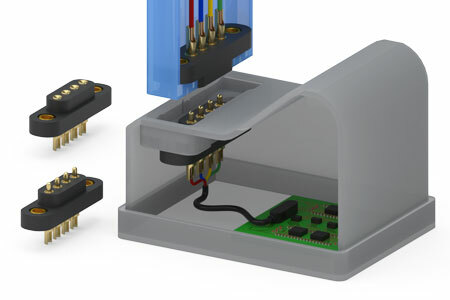 The new 868 series connectors include solder-cups to accommodate wire and cable attachment along with flanged insulators and fastening options. They are ideal for mounting into product housings for docking stations, cable terminations, heavy duty quick connects and panel mount equipment. The 868 interconnects are available on 4mm pitch, and feature uniformly aligned solder-cup pins to facilitate efficient soldering of wires up to 16 AWG. The 868-22-00X-00-0X1101 spring loaded connectors have heavy-duty spring pins with 0.050" (1.27 mm) diameter plungers that resist bending and binding during the application of side loads. The gold-plated stainless-steel spring ensures reliable operation to 1 million cycles and is less prone to stress relaxation when operating at higher temperatures over time (260°C max. @ 1 hour, 180°C max. @ 24 hours). Each spring pin is rated for 9 amps at a 10°C temperature rise with a contact resistance of less than 20 mΩ and provides up to .090” (2.29 mm) of stroke. The mating 868-10-00X-00-0X1000 target connectors are offered with the choice of either a flat or concave face on the mating side of the pins. The flat face style is .082” (2,08 mm) in diameter providing ample target area for the .050” (1,27mm) diameter mating plunger. Concave face targets provide additional surface area when mated and can aid in centering/alignment of components fitted with spring loaded connectors during manual engagement. Available in 2-6 positions, the 868 series connectors feature high temperature molded Nylon 46 insulators compatible with RoHS soldering processes. Mounting tabs, integrated into the insulators, provide a means for secure attachment to product housings or PCB’s. The tab holes may be specified with threaded inserts or left empty for other hardware requirements. Gold plated, precision machined brass components ensure the highest conductivity, corrosion resistance and durability.